All persons interested in attending the Regularly Scheduled School Board Meeting for Collinsville Public Schools, Independent District I-6, should make plans to attend the meeting at the following date, time and place to wit: Date: Monday Jan. 7, 2008 -- Time: 7:00 p.m.
7) Discussion and Review of Property Liability Insurance and Vote to Accept Recomendation of Duncall Duvall, Southwest General, Agency of Record. 9) Recognition of School Board Members During National Board Member Month. 12) Consideration of Naming the Baseball/Softball Field House. 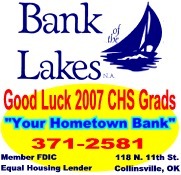 -- Athletic Director Bill Rule and CHS Baseball Coach Tony Reeder both said that the former "Pepsi Building" should be named for the Bob Cottingim and Eaton familes for all the past donations and support for many years to Collinsville schools, but a new donation exceeding $10,000 makes the decision much easier. The vending machine contracts with Pepsi (which have been restricted by nutritional legislation and will expire soon) had supported the building's initial years. Some ice storm damage at Herald and VoAg building ... will file insurance claims. The new playground equipment should be completly installed at the ECC by the end of the week. With 5 school days lost due to the December ice storm and only 3 weather days built into the original school calendar, Feb 18th (President's day) is a candidate as a potential makeup day (to be decided at the Feb. 4th board meet) for 1 of the 2 days make-up days. The Feb. 15th parent/teacher conference day can not be used for classes. Spring Break (Mar. 17-21) is currently not being considered for makeup but potentially could be if a significant number of additional day are lost to weather before then. A 25-foot easement on school property near 154th St. N. between 14th & 15th is being discussed with a new adjoining property owner (having been sold by Herb Weaver). -- Resignation: Terry Reed (bus driver) and hiring of Fred Cargill to take over the route -- approved.